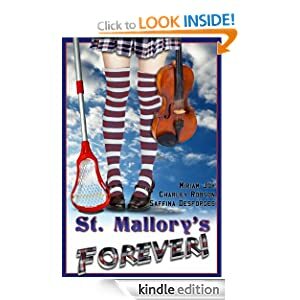 St Mallory's Forever! – Page 2 – A modern take on the boarding school mystery genre. Encounters of a Mallory Kind! It’s not even been a full year since Miriam, Saffi, Mark and I unleashed St Mallory’s Forever! into the wider world, and we’ve already had so many excitements. However, I think all can agree that seeing one’s pen-and-ink darling roaming about in *gasp* ADVERTISEMENTS! has to be one of the best in terms of producing high-pitched emotive reactions. I spotted this wee dandy lurking in the YouTube adverts! There’s another lurking about that has St Mall’s sitting right next to The Hunger Games, too! How exciting is that? This one is Miriam’s find – lurking in the Google ads pane no less, by the look of it! Of course, I didn’t drop by just to show these beauties off – although, I have to confess, that was part of it. ST MALLORY’S 2 is, as of tonight, in the form of an absolutely horrific Draft 0 opening chapter, in the works! And Miriam and I have decided to pull our fingers out this summer and try and get it done, dusted, and on its way to all of you lovely people by the autumn! Stay tuned, all! And have any of you spotted St Mall’s lurking about? Why not come stroke our egos and share your encounters? Aha, I see my emphatically placed exclamation point got your attention! Huzzah! It’s been a few months now since St Mallory’s Forever! made its debut into the world of the reading public, and it’s been an absolutely batty few months for us since then. We’ve written guests posts all over the place – including one at the Office of Letters and Light! – we’ve waited for the ebook to filter through the platforms, and we’ve even tripped over ourselves a fair few times in the run up to the availability of the paperback. Heck, I even did a radio interview with the BBC. And after that . . . life. Life, with all its multifaceted teeth, claws, and pointy bits. Coursework, sickness, mock exams, shiny things dangling from string – you know, our usual excuses. Sorry. We wish we could help it. However, I do not intend to slip into the void of creating apology posts – because that is bad and i would feel bad if I were to do it because it is bad. Instead, I come bearing hope. Hope in the fact that Miriam, Mark and I (who dares to commit the sin of breaking up the lovely alliteration) are plotting . . . ST MALLORY’S 2!!! Stay tuned, all! Once the dark clouds of exams have passed, who knows what silver-lined goodies await thee?